The Phosphorus mineral is another member of the major minerals family. Within the body, up to 80% of the Phosphorus mineral can be found in the teeth and the bones. Working together, both the calcium mineral and phosphorus are responsible for ensuring proper bone growth and maintenance. Within the bones and teeth, the Phosphorus mineral is present as calcium phosphate. In addition to this very important partnership with Calcium, Phosphorus is necessary for many other bodily functions. In fact, no other mineral has as many responsibilities. Probably its next most important function is its involvement in the production of collagen. Bone is 75% collagen, but joints, tendons, ligaments, cartilage, eyes and skin are also made mostly of collagen. The body would not be able to make these connective tissues and organs that are so vital without a steady supply of Phosphorus. Phospholipids, which are created when Phosphorus unites with fatty acids, reside inside cell membranes. Because they are both water and fat soluble, Phospholipids are actually what allows nutrients (both fat and water soluble) to pass through cell membranes. Cells would die without a way to take in and pass out both fat and water soluble nutrients. 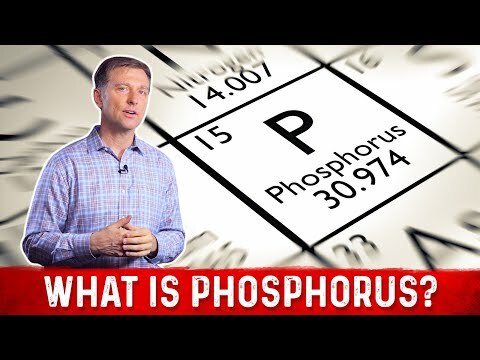 Phosphorus also is what gives cells their energy as it is the main component of adenosine triphosphate or ATP. Phospholipids also help keep the blood at the right consistency. As blood begins to clump together in large globules, it's more likely to get stuck to artery walls. As arteries become clogged, the risks for developing heart disease increase. Phospholipids keep blood from clumping in this manner. The body needs Phosphorus to make lecithin, which in turn makes bile. Without these components, gallstones can develop. It also prevents cirrhosis, a build-up of fatty acids inside the liver. Vitamins A, D, E and K, the fat soluble vitamins, could not do their jobs without having Phosphorus present, either. Good Phosphorus sources include many of the same foods that contain Calcium. Milk, hard cheese, yogurt, eggs, canned fish, chicken, red meat, nuts, walnuts, almonds, whole wheat and wheat germ and pumpkin seeds are all good sources. The RDA of Phosphorus is 1,000 mg for adults. Many of the additives in processed foods contain Phosphorus, and believe it or not, the need for Phosphorus is one situation in which eating processed foods may be better than being on a diet! However, even when dieting, eating a well balanced diet will provide all the Phosphorus the body needs. And because the kidneys are able to eliminate any excess, there is practically no risk of the body maintaining levels that could become toxic. Fortunately, Phosphorus deficiency is very rare since many foods, even those that are processed, contain this all important mineral. However, like Calcium, a Phosphorus deficiency can lead to problems with the bones including Rickets, osteoporosis, stiff joints and pain in the bones. A Phosphorus Deficiency can also cause anxiety, irritability, sensitive skin, stress, tiredness and weak teeth.